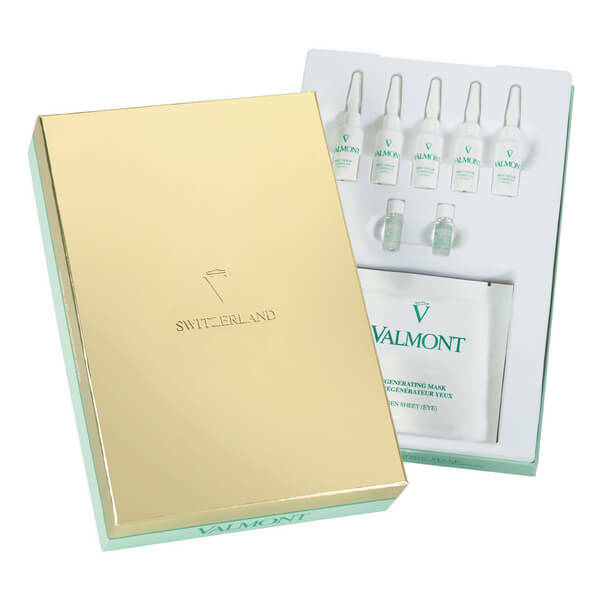 The Valmont Eye Regenerating Mask is an advanced variation of the original collagen face mask, offering additional benefits of active ingredients that specifically target the needs of the delicate eye contour. Infused with age-defying Collagen, the advanced formula instantly creates a refreshing sensation, with drainage-acting agents working to reduce the appearance of puffiness and dark circles to promote a lifted and wide-awake visage. The unique two-step system allows you to saturate each mask with a pre-measured dosage of serum, allowing for maximum potency and efficacy. An additional vial of Post Collagen is then applied directly onto skin, helping to enhance immediate results to leave skin feeling smooth and supple. The entire eye area feels rejuvenated and replenished, with fine lines and wrinkles visibly smoothed and a more even, brightened tone. The perfect pick-me-up. Soak the collagen mask in a 7 ml unit of Precursor Complex in the small dish provided for this. Position the smooth side on the edge of the upper and lower eye lids starting from the inside corner of the eye. Release the air bubbles using your finger or a smooth spatula. Let sit for at least 20 minutes. Take the mask off before applying several drops of the Post Collagen vial on the treated area, then proceed with the application of CONTOUR. Use as often as needed.